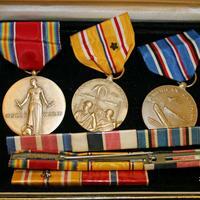 Box with war medals from WWII. One medal has lady liberty , one has 2 soldiers and one has a boat, submarine and aircraft. There are also 3 bars.